Plot 25, JBK plaza, 2nd Floor. Luwum Street. Hope to come back to Uganda for another trip! 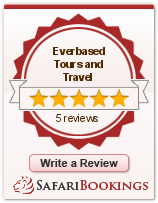 I had an amazing experience travelling with Everbased Tours to Uganda for my trip. Thank you team for the hospitality. This Safari will take you through Bwindi Impenetrable Forest,then you will drive to Queen Elizabeth National Park and finally to Kibale Forest before transfering back to Kampala. On this tour,you’ll make a stopover at the Equator as you drive to Lake Bunyonyi,then you’ll go to Kibale Forest National Park for trekking and then back to Kampala. This 3 days Safari will take you to go track the rare mountain gorillas at the famous Bwindi National Park and also visit the locals before heading back to Kampala. This Safari will take you from Kampala for Bwindi National park via Masaka,then to Lake Bunyonyi for relaxation. This Safari will take you to Bwindi park then to Mgahinga Park for Golden monkey trekking before returning back. Ever Based Tours and Travel © 2017.